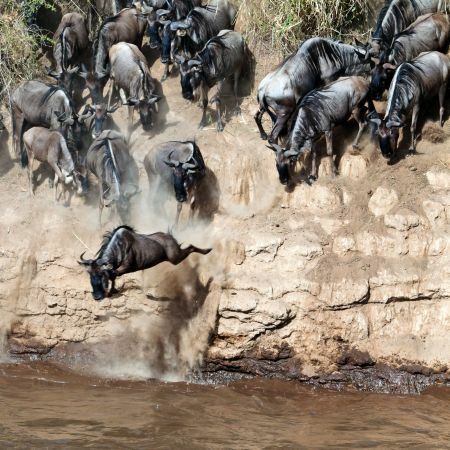 The Great Migration is not only one of the most amazing safari experiences that Africa has to offer, but it is also one of the world's most spectalular naturally occuring events. Welcome to the Greatest Show on Earth! The Great Migration is an overwhelming, humbling and quite simply amazing wildlife experience. 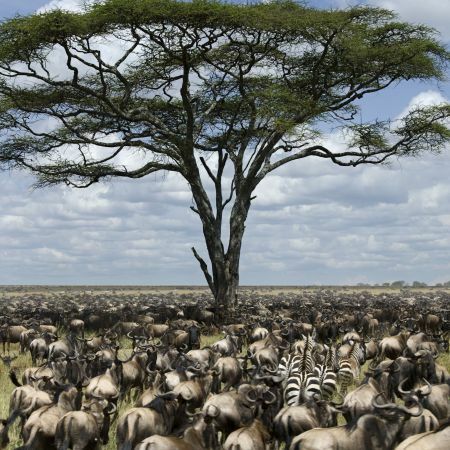 Every year over 1.5 million wildebeest, 200,000 zebras and 350,000 gazelles gather on the vast plains of the Serengeti in Tanzania to begin their remarkable race towards greener grazing lands. Following the rains, they head north towards Kenya's Masai Mara before about-turning and dashing south again. It's a sprint for survival, covering a total of over 1,800 miles and the journey is incredibly tough. An estimated 250,000 wildebeest don't make it - only the strong survive. Witnessing this astonishing feat of nature is a real life-changer. The sight of this epic herd thundering across the savanna and the deep rumbling sound of almost 8 million hooves, kicking up huge storms of dust, is something that will stay with you forever. It's an experience that batters all of your senses - heart-thumping, eye-opening, ear-splitting and ground-trembling all at once. The stunning landscapes of the Serengeti and the Masai Mara form dramatic backdrops to the event, with everything combining to create what surely is the ‘Greatest Show on Earth'. It's one of the definitive safari experiences, and words just can't describe the feeling of being there in the flesh. Charting the date and course of the migration is far from an exact science. The exact route and timing of the migration will vary from year-to-year, and it is impossible to predict where they will be on any given day when we are planning a holiday many months in advance. However, we can use our safari experience to help put you in the areas where you are most likely to see the migration at any given time. Broadly speaking, here's a description of the route that this extraordinary race for life takes each year to help you get your planning off the ground. The story begins with the wildebeest calving season in the Ndutu region of the Ngorongoro Conservation area and the Southern Serengeti plains, where the wildebeest begin to congregrate together from December. Amazingly, it’s estimated that 500,000 of these calves are born during a tiny 2 to 3 week window in February! The mass calving season attracts all kinds of predators to the area, all eager to snag themselves newborn, wobbly-legged calves. With the rains beginning to end, the ground dries up very quickly, so the herd starts its long trek between April and May, heading for the greener land of the Masai Mara. Pounding the earth with millions of hooves, they travel in a clockwise direction towards the long grass plains and woodland, heading up towards the central Seronera Serengeti Plains and into the Serengeti’s Western Corridor, leaving their arid breeding ground behind. May is also the mating season for the wildebeest, and the competition is fierce as the male wildebeest rut and battle to win female attention and stamp their territory. These strapping contests of manhood are staggering to behold. By June, the migration reaches the Grumeti River. This is the first of 2 river crossing that the animals face and for many, unfortunately, it is also the last. Weary from their slog so far, many of the animals do not have the strength to run the gauntlet of large, hungry crocodiles and cross to the safety of the opposite bank. The lucky ones that make it across the Grumeti River now head towards the Kenyan border, but before they’re rewarded with the lush pastures of the Masai Mara, they’re forced to make yet another river crossing. This time it’s the fast flowing, deep Mara River, beset once again with danger from eddying currents and swarming crocodiles. This is the most perilous part of the journey and it’s a literal case of survival of the fittest - a spectacular show of nature at its wildest and most brutal. Finally, after its gruelling trek, the herd reaches its destination and from August to October, the Masai plains are filled with grazing wildebeest, zebra and gazelles. Of course, this doesn’t mean that life becomes easy, as danger still lurks in the form of hunting prides of lion and hyena. Wherever the herd goes, the predators follow. The rains begin again in the south around November time, drawing the herd back to its calving grounds. The animals set off on their journey back towards Tanzania to complete this incredible circle of life. And so in February, the calving season gets underway again on the Serengeti and the story repeats itself year after year. So, for the herd, the journey never really ends. It’s constantly on the move in a struggle for survival. It is possible, with some very careful planning, to catch this phenomenon and see part of this story in action. 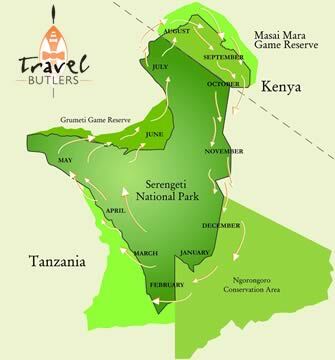 You can witness the migration at its different stages from a number of safari lodges located along the migration route. Alternatively, for a really grassroots experience, you can even choose a mobile tented safari option, which only decides the location of its camps once the migration is in full swing. As safari experiences go, there’s nothing that can touch it.